During a WWDC session earlier this week, Apple revealed a new Lightning module for headphones that promises to provide deeper system controls, direct analog audio out and power to compatible accessories. Slide from Apple's WWDC session on accessories. 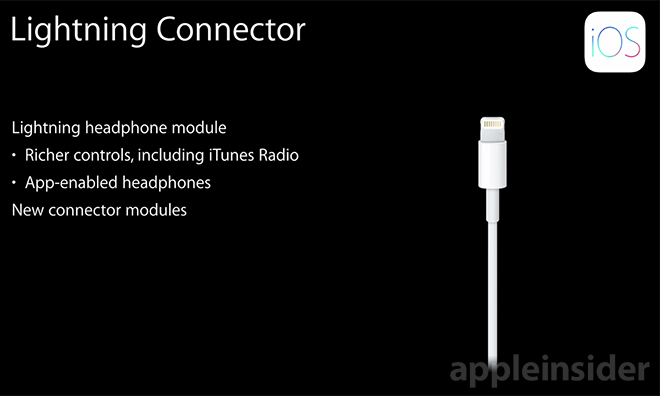 Unlike the ubiquitous 3.5mm jack used in modern portable audio devices, the new Lightning headphone module offers a number of advantages to third-party accessory makers, Apple said during the "Designing Accessories for iOS and OS X" session on Tuesday. According to Apple's manager of platform accessories Robert Walsh, the new Lightning headphone module connects directly into an iOS device's Lightning port, breaking out analog audio. In addition, the module offers more bandwidth and a digital interface for richer control of system services like iTunes Radio. "If your headphones support, for example, noise cancellation, you can offer an app on your device that communicates with your headphones that controls how it operates," Walsh said. Alongside the increased bandwidth on tap from Lightning, the connection standard can deliver power to advanced headphone accessories. By offloading energy supply duties to an iPhone or iPad, a headphone maker can do away with some of the bulk that comes from designing space for a battery pack. Finally, Apple said it is working on specialized small form factor connector modules for manufacturers looking to build form-fitting cases and cables. It is unclear when hardware makers will roll out a Lightning-enabled headphone, but with the specification now available the first models may see release in time for iOS 8. Apple may also be working on its own solution in a Lightning-enabled EarPods design, though evidence that such hardware is in development has yet to surface.